Jason Mahaffey (pictured) won the Shawn Stansell Memorial 96-lap street stock feature at Shady Bowl on Saturday. DeGRAFF – It was a great night of racing at Shady Bowl Speedway on Saturday as four divisions of stock cars saw action. It got off to a rocky start, as rain held up the start of the racing for one hour. The main event was the running of the Shawn Stansell Memorial for the street stocks. The race honored the memory of Stansell, a past champion and feature winner in his family-owned Camaro. Stansell was fatally injured in a highway accident in February. Since Stansell spent most of his career in a car sporting the number 96, the race was 96 laps. The 96-lapper was a dogfight all the way, as Dayton’s Jason Mahaffey put his Quick Parts Monte Carlo out front and the battle shaped up behind him for the lead. Rodney Roush and Josh Sage were soon on Mahaffey’s back bumper. Sage broke free of Roush in the later stages of the race and began a battle with Mahaffey that had the fans on their feet. When the dust cleared after lap 96 it was Mahaffey posing for the winner’s pictures for the first time. Sage, who did everything but climb into Mahaffey’s trunk, had to settle for second. The margin of victory for Mahaffey was .808 seconds. Ryan Amonett was third in the feature and picked up the DeGraff Service Center Hard Charger award. Don Mahaffey Jr took fourth place sliding backwards through the grass at the flag stand. Jim Lewis Jr. finished fifth. The dash was won by Jacob Muncy. Nate Purtee and Rob Schaeff took home heat honors. The Biggins Small Engine Repair Modifieds took to the oval next. Brian Brandyberry took the lead at the drop of the green flag and led through lap 13, when Chris Parker took over the lead in his Zimmerman Realty backed open wheeler. The race quickly turned into a three-car shootout. Parker and Brandyberry were joined by Logan McPherson. The three drivers exchanged paint and positions in a great battle for the win. Parker led the money lap for the second time this season. Parker won the dash, with Rob Bryant and Paul Henry notching heat wins. The Hangar 18 Race Cars Hobby Stocks rounded out the program with DeGraff’s Jason Purtee taking win No. 9 in his family owned Ford. Purtee is sponsored by Fat Boy Pizzas. Andy Pine tried every trick he knew to pass Purtee, finally he could only watch as Purtee took the checkered. Les Rhodes, Patrick Woods and Travis Fogt rounded out the top five. This Saturday will be a big night at the speedway. The Buckeye FWD Mini Stocks will do battle in a 125-lap feature with the winner taking home $1,500. The Biggins Small Engine Repair Modifieds, street stocks and the Hangar 18 Race Cars will also hit the pavement. It will be the last points race for the Street Stocks only. It will also be Emerson Technologies Fan Appreciation Night. 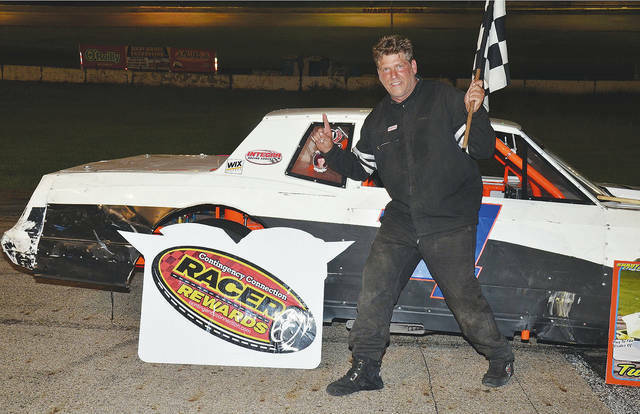 Racing will start at 7 p.m.
https://www.urbanacitizen.com/wp-content/uploads/sites/36/2018/09/web1_mahaffey.jpgJason Mahaffey (pictured) won the Shawn Stansell Memorial 96-lap street stock feature at Shady Bowl on Saturday.